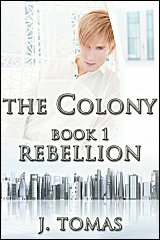 The Colony Book 1: Rebellion is now available! Some of you may know already that I write gay young adult stories under the name J. Tomas. My latest novel is part of a duology (meaning there will be a total of two books in the series). This is one of my personal favorites — I love these stories and their characters and the setting, and I really hope my readers will enjoy the books as much as I have enjoyed writing them.